The Dosti Unlimited Offer, recently launched by Warid in Pakistan, is actually a combination of Friends and Family Offer, Daily Unlimited Data and Monthly Data Bundles which can efficiently cater to all of your voice and data needs. The offer can be activated by sending FNF in an SMS to 7777 that will cost you just Re.1. For the addition or deletion of on-net numbers, you need to send Add or Del to 2129, but in this case, you will be charged Rs. 2 per SMS. You will have to pay Rs. 9 for the addition of a new contact to the FNF list. For making a call to any of these numbers, you will be charged Rs. 9.99 a day. However, you can also deactivate the offer by sending FNFOff in an SMS to 7777. Being a hassle free offer, it will be renewed automatically after every single day. For subscription, UL has to be sent in an SMS to 7777 and about Rs. 11 will be deducted from your account balance, i.e. SMS and offer charges of Re. 1 and Rs. 9.99, respectively. Now you have up to 100 MB of data browsing to be utilized all the daylong. However, it is not renewed automatically and you have to subscribe it on daily basis. 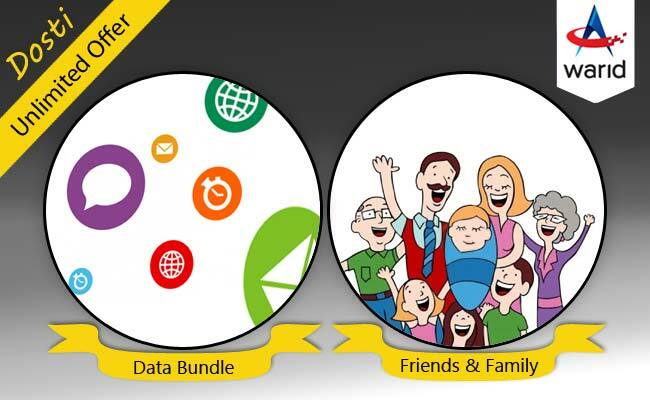 Here you can enjoy 500MB and 2GB of data bundles for Rs. 150 and 500 per month, respectively. The activation is also very easy, i.e. send 500MB or 2GB in an SMS to 7777 for the respective offer. It is important to note that this offer eliminates the need for daily subscription which will not only save your time but also render you a carefree environment. Nonetheless, you have to renew it after the expiry of this period. None of the mobile telecommunication companies in Pakistan is offering as many as 10 FNF on-net numbers on a single SIM, but Warid does. The charges are also comparatively less and affordable of an ordinary mobile user, i.e. just Rs. 10 per day. Different companies offer 5 to 10 MB of data with the charges ranging from Rs. 5 to 10 on daily basis, but Warid is providing 100 MB of internet data browsing for just Rs. 10 a day! On other networks, FNF offer is associated with certain packages, but Warid removes this barrier and you can enjoy the service on any of the packages. Though these promotional features are not entirely new, but are unique and comparatively better. In the post modern era of 21st century, internet has become an unavoidable necessity of life for all and sundry, and if the same facility is available on your mobile device, you may boast of being one of the luckiest people in the world. Though the taxes are not inclusive of the charges mentioned here, the overall expenditures are far less than the worth and quality of the services you will be provided with. This is a limited time offer that can be terminated at any time in future. Such promotional strategies by the mobile telecommunication companies are not a static phenomenon and are updated, renewed and relaunched from time to time owing to the intense market competition.